A Syrian-American lobbyist who pushed the Obama administration to support Syrian jihadists met with National Security Council (NSC) staffers Thursday afternoon. 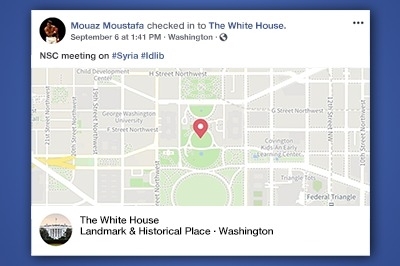 Mouaz Moustafa, executive director of the Syrian Emergency Taskforce (SETF), noted the meeting on his Facebook page. A NSC source confirmed that the meeting took place. Moustafa frequently lobbied the Obama White House to support Syrian rebel groups against ISIS and the Assad regime. He pressured Congress and the Obama administration to support a train-and-equip program that saw American weapons end up in the hands of al-Qaida and ISIS. The Trump administration canceled the operation. The NSC meeting focused on Syria's last remaining jihadist stronghold, Idlib province, Moustafa wrote. He did not detail what he said about it. Iran, Russia and the Assad regime reportedly are planning an assault on the province to eliminate this last pocket of Sunni jihadist resistance. Turkey has troops there. President Trump warned last week that the operation could be "a grave humanitarian mistake" which could claim hundreds of thousands of lives. Moustafa is best known for bringing U.S. Sen. John McCain to Syria in 2013, where McCain met with Free Syrian Army (FSA) leader Gen. Salem Idris. Many FSA factions had jihadist ideologies. Idris tweeted his support for al-Qaida's Syrian affiliate in 2015. Moustafa urged the Obama administration in 2013 to support a now defunct FSA splinter group called the Islamic Front, calling it "the only counterbalance to extremists." Its constitution contradicted Moustafa's talking points about democracy and freedom in Syria. "The focus now is to depose the regime and kick out people like Hizballah and the Iranian Revolutionary Guard, and others that are killing us. And so that's the best way to describe their ideology," Moustafa said in a 2013 podcast. "I think the international community and the West ... must engage with the Islamic Front and need to be more pragmatic and realistic about what is going on ground in Syria in order to bring them on board with whatever political solution will happen in the future." The Long War Journal reported in 2014 that al-Qaida was able to influence the Islamic Front without publicly acknowledging its role. Khalid al-Suri, an associate of al-Qaida leader Ayman Zawahiri, co-founded Ahrar al-Sham, a key faction in the Islamic Front at the time of Moustafa's statement. Ahrar al-Sham's leadership condemned democracy and mourned Taliban leader Mullah Omar in 2015. Ahrar al-Sham's co-founder Khalid al-Suri was an associate of al-Qaida leader Ayman Zawahiri. Hasan Aboud, another Ahrar al-Sham founder, condemned democracy and expressed support for a caliphate. It mourned the death of Taliban founder Mullah Omar to whom al-Qaida and Zawahiri owed fealty in 2016, another example of its ideological leanings.